Most manufacturers offer what many believe to be a better product simply by adding more blades and foils to both electric shavers and safety razors. While 'more' may sound great, it does not guarantee better results. The crucial factor is how much of the foil or blade is in actual contact with the skin. The safety razor, invented in the late 1800's, had just a single blade. This design remained the same for decades. Then in the 80's came the advent of multi blade razors. At first there were 3 blades and then 5, and now there is actually a razor with 10 blades. These innovations promised a better, closer, smoother shave. The faulty logic in this is "10 blades must surely be twice as good as 5" - right? Not so fast! The fact is, as a consumer you pay far too much for all those extra backup razor blades, even though they cannot do very much more than a single blade. The annual replacement blade cartridge for the average safety razor, is around $95 - $125 per year. That is about twice what the Bare It All personal shaver costs to buy, lasting two years by comparison. When the leading blade of your multi blade razor gets dull and blunted, as it does after even a few shaves, it begins to drag and pull at the hairs rather than cut. No matter how many blades follow the first blade, the hairs will always first encounter the leading dull blade and the shaving experience will be very ineffective and uncomfortable. So you see all those extra blades are only as good as the first blade and not worth the extra cost. More is not always better, as far as shavers and razors are concerned. The idea of multi head electric shavers began to take hold sometime ago and now you can get electric shavers with one, two, three and five head shavers. The manufacturers of these "improved" shavers had to shrink the size of the shaver foils in order to fit them into a reasonable sized shaver that would fit into the hand easily. However these 3 to 5 head shavers, their foils only have holes round the edges of the foil and none in the center. So the extra heads really do not add to the actual cutting surface area of the shaver which is what a good shaver all about. It is an extra cost for no advantage. While it may not sound logical, a single head rotary shaver can have more holes in contact with the skin than multi head shavers that may look bigger. The hi tech foil, used on the Bare It All MK 2 and Mk 3 shavers, is specially designed to be irritation free and rash and bump free - for those with very sensitive skin. The skin under the chin and on the neck as well as in the pubic area is much thinner and more sensitive than the skin on the face. The Bare It All foil is ideal for shaving these difficult areas. The holes in the foil which do the cutting, are smaller in the center of the foil so that the skin cannot be pushed through into the path of the blades - unless of course you press down too hard. 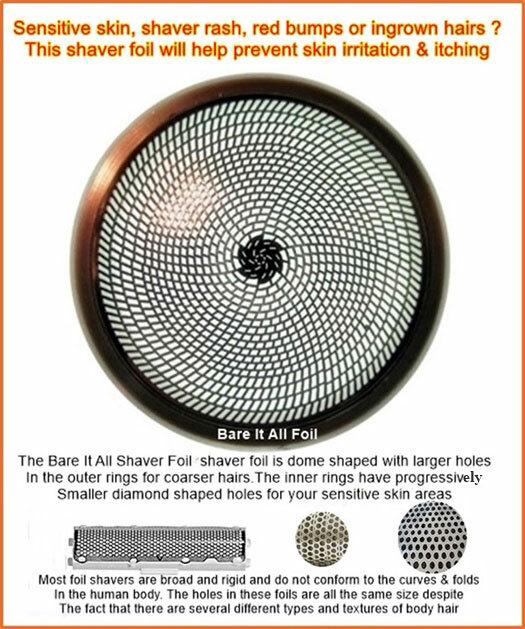 Bare It All's Unique Shaver Foil: Our ultra thin foil, with a larger surface area to contact more of your skin, gets the blades closer to cut hairs painlessly with no shaver rash, red bumps or ingrown hairs.